The purpose of this study was to explore clinical features and the operational opportunity of traumatic cervical disc herniation. Patients with cervical spine injury (413) were retrospectively reviewed. Six patients with neurological deficits were identified to have disc herniation without adjacent bone lesion. The diagnosis was confirmed by MRI. 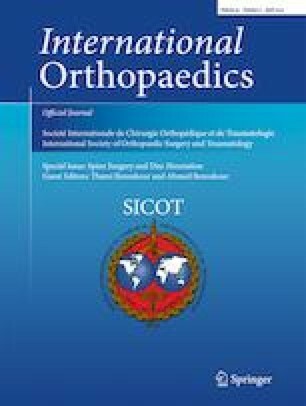 The Japanese Orthopedic Association (JOA) score was used to assess the severity of clinical symptoms. Different grading systems have been used in analyzing various stages of herniated cervical discs. All patients underwent anterior cervical decompression, insertion of autologous iliac crest graft, and fixation with cervical plate. The causes of injury were road traffic accidents in four patients and sport and domestic accidents in one patient each. There were five patients with single intervertebral disc herniation and one patient with double. Pre-operative JOA score was 14 for three patients, the remaining three patients scored 10, 6, and 3 respectively. At final follow-up, the score was 17 for four patients and 14 for two patients. Traumatic cervical disc herniation with neurologic deficit and without adjacent bone lesion is a rare condition. MRI is the golden examination to confirm diagnosis. Early recognition is essential for appropriate therapy and to minimize the extent of neurological deficit. The MRI is mandatory in diagnosing different types of traumatic herniated cervical disc. Discectomy and anterior cervical interbody fusion using autologous iliac crest graft are the treatment options.